Americans have blamed many culprits, from mental illness to inadequate security, for the tragic mass shootings that are occurring with increasing frequency in schools, offices and theaters across the U.S. Yet in our nation’s ongoing conversation about the root causes of gun violence, the makers of guns are hardly ever mentioned. As a public health researcher, I find this odd, because evidence shows that the culture around guns contributes significantly to gun violence. And firearm manufacturers have played a major role influencing American gun culture. To help spur this much-needed discussion, I’d like to share some critical facts about the firearm industry that I’ve learned from my recent research on gun violence prevention. The U.S. is saturated with guns – and has become a lot more so over the past decade. In 2016 alone, U.S. gun manufacturers produced 10.6 million firearms for entry into the market, up from 3.6 million in 2006. Pistols and rifles made up about 85 percent of the total. In addition, only a small number of gunmakers dominate the market. The top five pistol manufacturers alone controlled half of all production in 2016: Sturm, Ruger & Co., Sig Sauer, Glock, Kimber Manufacturing and SCCY Industries. Similarly, the biggest rifle manufacturers – Remington Arms, Sturm, Anderson Manufacturing, Smith & Wesson and Savage Arms – controlled 62.3 percent of that market. But that only tells part of the story. A look at the caliber of pistols manufactured over the past decade reveals a significant change in demand that has reshaped the industry. The number of manufactured large caliber pistols able to fire rounds greater than or equal to 9 mm increased six-fold from 2005 to 2016, rising from just over half a million to more than 3 million. The number of 0.380 caliber pistols – small pistols designed specifically for concealed carry – jumped to over 1.1 million from just over 100,000 during the same period. This indicates a growing demand for guns with increasing lethality and a design focused specifically on self-defense and concealed carry. Production of rifles has also increased, rising from 1.4 million in 2005 to 4.2 million in 2016. This is driven primarily by a higher demand for semi-automatic weapons, including assault rifles. So what can explain the jump in the sale of high caliber handguns and semi-automatic rifles? 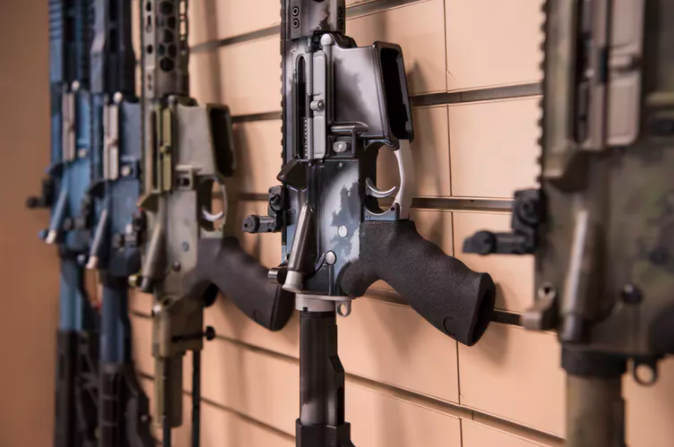 Gunmakers have become very effective at marketing their wares as necessary tools for self-defense – perhaps in large part to offset a decline in demand for recreational use. For example, in 2005, Smith & Wesson announced a major new marketing campaign focused on “safety, security, protection and sport.” The number of guns the company sold soared after the switch, climbing 30 percent in 2005 and 50 percent in 2006, led by strong growth in pistol sales. By comparison, the number of firearms sold in 2004 rose 11 percent over the previous year. There’s strong survey evidence that gun owners have become less likely to cite hunting or sport as a reason for their ownership, instead pointing to personal security. The percentage of gun owners who told Gallup the reason they possessed a firearm was for hunting fell to 36 percent in 2013 from almost 60 percent in 2000. The share that cited “sport” as their reason fell even more. Meanwhile, 63 percent of gun owners in 2016 reported self-defense as their primary motivator, up from 46 percent in 2004, according to a Harvard School of Public Health survey. Another possible explanation for the uptick in handguns could be the widespread adoption of state “stand-your-ground laws” in recent years. These laws explicitly allow people to use guns as a first resort for self-defense in the face of a threat. Utah enacted the first stand-your-ground in 1994. The second adoption did not take place until 2005 in Florida. A year later, stand-your-ground laws took off, with 11 states enacting one in 2006 alone. Another dozen passed such laws since then, bringing to the total to half of all states. These laws were the result of a concerted National Rifle Association lobbying campaign. For example, Florida’s law, which George Zimmerman used in 2013 to escape charges for killing Trayvon Martin, was crafted by former NRA President Marion Hammer. The American Legislative Exchange Council, an association of state legislators dedicated to limited government of which the NRA was a member, has helped push the laws around the country using a model drafted by another NRA official. It’s not clear whether the campaign to promote stand-your-ground laws fueled the surge in handgun production. But it’s possible that it’s part of a larger effort to normalize firearms for self-defense. This overall picture suggests that a change in firearm industry marketing fueled an increased demand for more lethal weapons. This, in turn, appears to have fostered a change in gun culture, which has shifted away from an appreciation of the use of guns for hunting, sport and recreation and toward a view that guns are a necessity to protect oneself from criminals. How and whether this change in gun culture is influencing rates of firearms violence is a question I’m currently researching.